South Shore YMCA inclusive programming assists individuals with developmental disabilities or special needs to become independent, engaged, and successful at the Y and beyond. 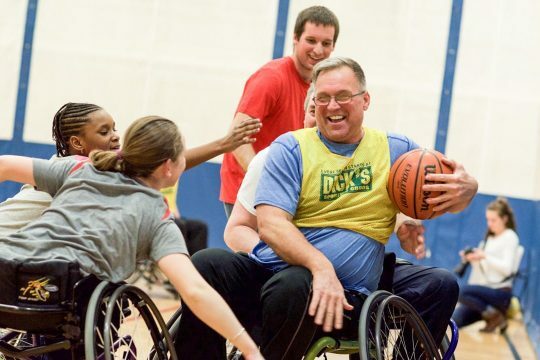 At the South Shore YMCA, our goal is to provide an inclusive environment where all members are equally a part of our community, and we make it a priority to provide facilities, programs and services that are accessible to all. We continue to expand our inclusive programming to better serve our members with disabilities. Lauren holds a B.S. degree in Sport & Movement Science with a concentration in Exercise Science from Salem State University, and is an ACSM Certified Personal Trainer. In 2014, she began working at the Emilson YMCA in our Health & Well-Being department, where she discovered a passion for inclusion programming. She became an assistant social skills teacher, and then an Inclusion Specialist for our Summer Camp program. Lauren also instructs an Adaptive Fun and Fitness class, working fitness into the lives of those with special abilities. Julianne received her B.A. in Health Sciences from Quinnipiac University in 2014. She is a Paraprofessional in the Rockland Public Schools. Her goal is to earn her Masters in Special Education. Julianne joined the YMCA as an Inclusion Specialist at Camp Gordon Clark in the summer of 2016 and currently works with the Building Bridges Social Skills group at the Emilson Branch. The Y is a charity. When you give, we can give back. Help us to provide those with developmental/ intellectual disabilities the chance to engage and thrive at the Y.